Central Manitoulin Public School student Eric Wahl, representing the Little Current Legion Branch #117, is presented with the first place medal and certificate for the primary division at the Zone H3 Royal Canadian Legion public speaking competition in Onaping Falls. ONAPING Falls—Three Island youth placed first at the Zone H3 Royal Canadian Legion Public Speaking competition in Onaping Falls last weekend and will be moving on to represent the area at District H competition in Sudbury on Saturday, March 25. Representing the Little Current Legion Branch #117 was Eric Wahl from Central Manitoulin Public School in the primary division, Thomas Green from Little Current Public School in the junior division, Darci Debassige from Lakeview School in the intermediate division and Manitoulin Secondary School student Sandi Kuntsi in the high school division. From the Gore Bay Legion Branch #514 were Amara Wilson-Zegil in the primary division, Mason Leighton in the junior division, Malia Leighton in the intermediate division and April Torkopolous in the high school division. Eric placed first in his division, as did April and Mason—with all three advancing to the district competition later this month. Fellow Island competitors also placed strongly in their divisions with Thomas placing second, Darci third, Cassandra third and Amara third. Eric, a seven-year-old Central Manitoulin Public School Grade 2 student, did his speech on his family Christmas. “I was a little nervous before,” said Eric of presenting his speech at zone competition. Eric made it to the zone competition last year as well for his speech on his big sister, placing third. Eric said that he is ready for the next competition and will be practicing in front of his parents to help him prepare. April, a Grade 10 student at Manitoulin Secondary School, also made it to the zone competition two years ago for her speech about going to high school, placing third. April said she is excited and confident about heading to the district competition. Mason, a Grade 6 student at Charles C. McLean Public School, delivered his speech on duct tape. Mason is also a Zone H3 speech veteran, making it to the competition two years ago for his speech about his military family. 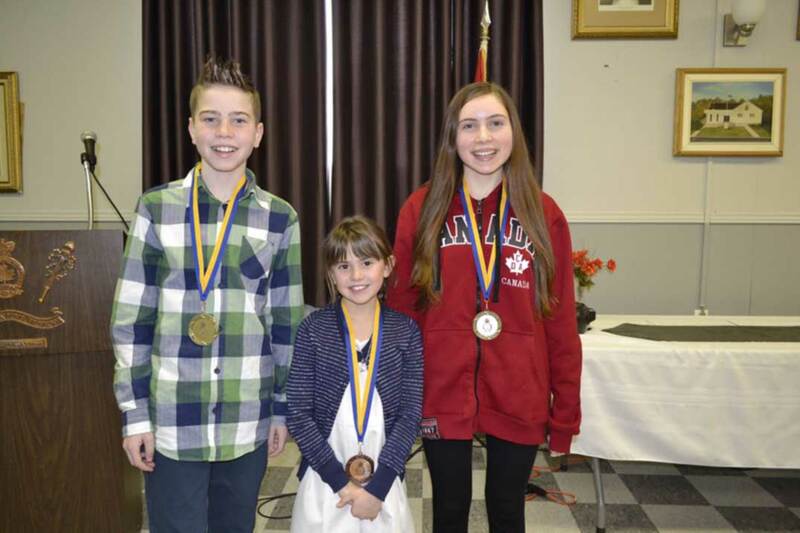 Eric, April and Mason will be representing the Zone H3 at the District H Royal Canadian Legion Public Speaking competition in Sudbury on Saturday, March 25. From left, Mason Leighton placed first in the junior division, Amara Wilson-Zegil placed third in the primary division and April Torkopolous placed first in the high school division at the Zone H3 Royal Canadian Legion Public Speaking competition in Onaping Falls. All three along with Malia Leighton competing in the intermediate division, were representatives of the Gore Bay Legion Branch #514. 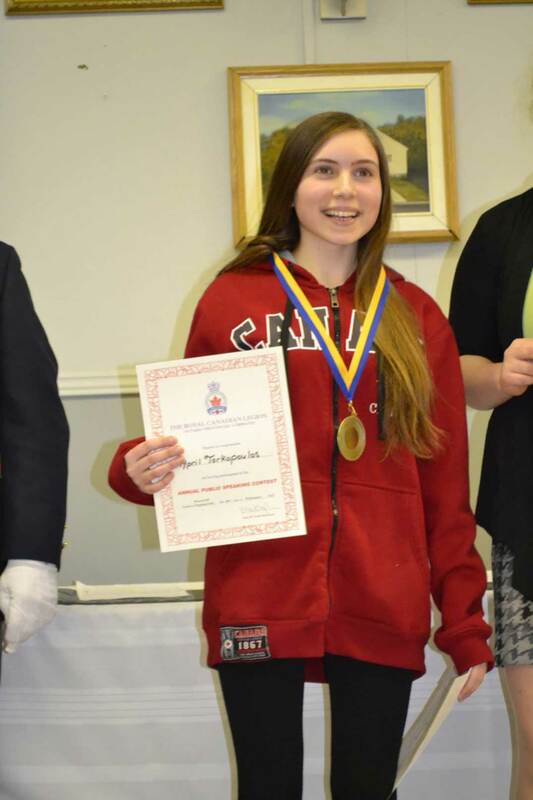 April Torkopolous, representing the Gore Bay Legion Branch #514, places first in the high school division at the Zone H3 Royal Canadian Legion Public Speaking competition in Onaping Falls held last weekend.